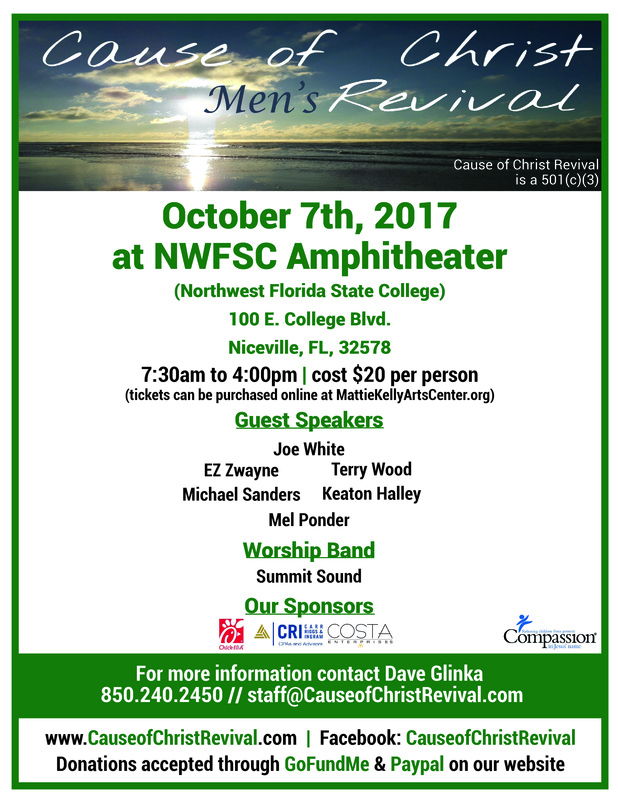 ​The conference had to be moved from the NWFSC amphitheater to Crosspoint Church in Niceville due to Hurricane Nate. The Revival has moved to an indoor venue due to weather concerns. It will now be held at Crosspoint UMC. You can purchase tickets at the door. A limited number of McDonald's breakfast sandwiches/McGriddles will be for for sale in the morning. Chick-fil-A chicken sandwiches will be available for purchase during lunch break (midconference). Congressman Mel Ponder is District 4 Florida House. The former Mayor of Destin is a Godly public leader in a secular world. Mel Ponder doesn’t just talk conservative values – he lives them in every walk of life. For Mel, faith and family come first: he raised three children with his wife of 24 years, and helped institute the Destin Week of Blessings, an annual event that unites area pastors and churches. He and his wife have dedicated themselves to their community, serving on the boards of many ministries and nonprofits. Dr. Joe White is the President and founder of Men at the Cross as well as the President and owner of Kanakuk Kamps and the founder of Kids Across America and the missions oriented foundation, Cross International. Joe has also authored 23 books designed to reach teens and families including Faith Training, FUEL and What Kids Wish Parents Knew about Parenting and the Gold Medallion Award winning book, Pure Excitement. Joe has spoken before many professional football and professional baseball teams, as well as countless churches, college crusades, and youth events. He has a vision to reach men through discipleship for the glory of God. To learn more about his ministries visit www.kanakuk.com, www.pureexcitement.com, www.whatsafterdark.com and www.menatthecross.org. two daughters live in Niceville. Mike has been part of back-to- back national championships in D-I Collegiate Men’s Ice Hockey and has been to the White House where he met President George W. Bush. After receiving a B.A. in Visual Communications from Judson University, Keaton worked as a Graphic Designer for a major Christian publication. Wanting to be more effective in reaching our culture with the Bible’s truth, Keaton also earned a Master’s degree in Christian Apologetics from Biola University. As a member of a local creation group in his home state of Illinois, Keaton gained valuable experience in communicating the relevance of the Genesis account of creation to the Gospel’s big picture. Find out more about Keaton at http://creation.com/keaton-halley. Terry Wood will not be able to make the event. He experienced automobile difficulties during the trip from Indiana and had to turn back home. We will miss his great talk on evangelism in the workplace! Mr. Wade is unable to make the event due to hurricanes Harvey and Irma. He is a volunteer FEMA inspector and is giving his time and energy to helping those in need. Mel Ponder is an American politician who is a Republican member of the Florida House of Representatives. He was the mayor of Destin, Florida from 2014 to 2016. Now Mel wants to bring his principles to the Florida House, where he will work to protect our conservative values and ensure they have a voice in Tallahassee! Mel will be the Master of Ceremonies and a prayer leader at the Revival.